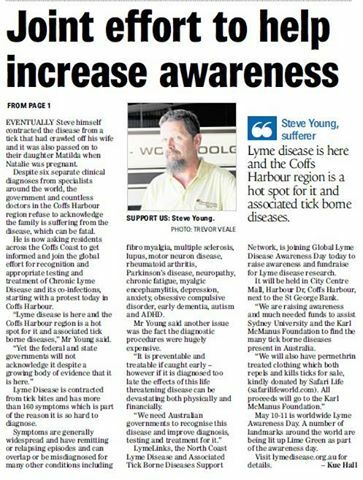 New South Wales: Coffs Harbour - Awareness Event, May 11th. The Days Round-up: In Coffs Harbour, New South Wales, the weather was a little unkind with intermittent showers throughout the morning. 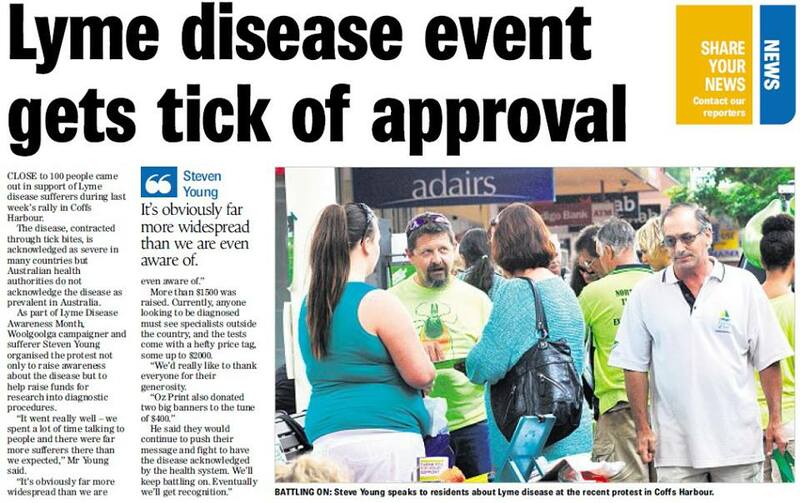 Despite the rainy weather however, the NSW North Coast team ensured that the Lyme word was spread, with around around 100 Lyme patients, their families and friends gathering to raise public awareness of Lyme and co-infections. Hundreds of brochures were handed out, tick repellent clothing was sold and there was raffles to raise money for Lyme research. See below for: Photos of the day, as well as photos of the Big Banana lighting up green. Links to media/news stories. The Big Banana for lighting up green. Special thanks to Michael Lockman (GM) for organising on such short notice. Many thanks also to OzPrint at Coffs Harbour for making and donating the extra large posters seen in the photo opposite. Photo: Steve and Matilda Young. 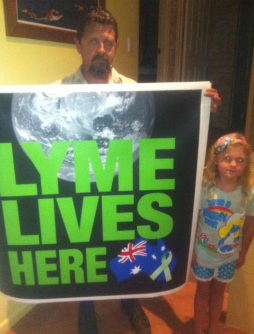 Steve is holding up a poster of the 'Lyme Lives Here' "Avatar" concept developed by Tom Goddard and Sharon Whiteman (LDAA) and designed by Sim Hadad. 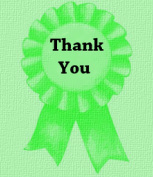 Many Lyme patients around Australia changed their profile picture to the avatar to represent solidarity in May. The Avatar was also used by people around the world, with the flag/map being altered to represent their own country. Steve and Natalie Young, Sara Walker and Teri Houbert as well as everyone that contributed and came along to help make this event so successful. Picture Below: Steve Young being Interview for News Story "Attention Drawn to Lyme"
A big thank you also goes out to Dianne Rae - Australia had 17 buildings and landmarks lighting up for Lyme Awareness. Thanks to Dianne - the Big Banana was one of those. It lit up green for Lyme on Friday 10th and Saturday 11th of May. 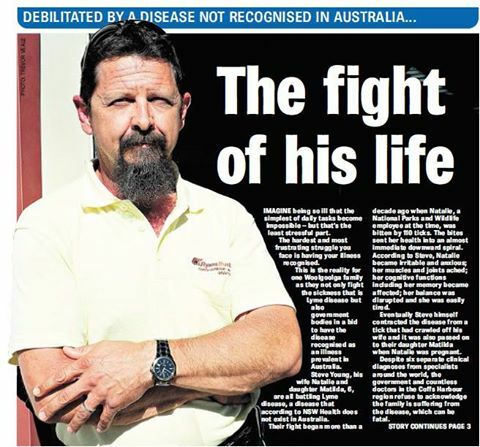 "Green Light Shines a Spotlight on Nasty Disease"
"Lyme disease event gets tick of approval"
"The Fight of his Life"